When Oakland passed its interim mobile food vending policy a year ago, allowing food trucks to hawk their wares legally outside of the Fruitvale for the first time, the people rejoiced — many of them happy, in particular, to finally get some decent lunch options near downtown workplaces, at least a couple days a week. But what everyone really wanted to know was: When was Off the Grid — the granddaddy of all food truck parties, at least here in the Bay Area — coming to Oakland? Finally, we have an answer: On Friday, January 25 — and every Friday after that — from 5 p.m. to 9 p.m., Off the Grid will pop up outside the Oakland Museum of California. The weekly event will feature a lineup of ten mobile food vendors (with room to expand to as many as twelve), all parked on a single block of 10th Street, between Oak and Fallon, which will be closed off to traffic. Friday nights at the museum will now come with a side of food trucks. If you like food trucks, chances are you know Off the Grid, which is most famous for its thirty-plus-vendor behemoth at Fort Mason (closed now for the winter) — none of this two-or-three-trucks-pulled-over-at-a-curb business. 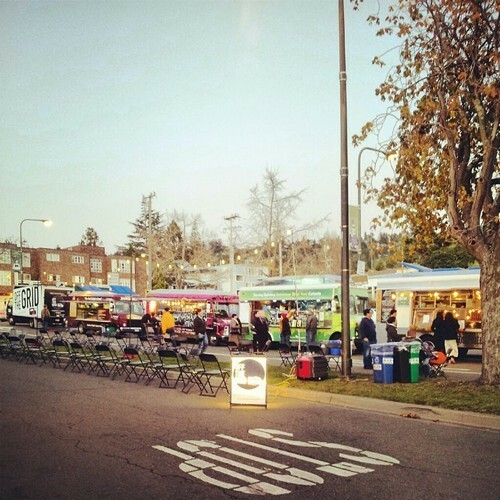 With at least fifteen other weekly mobile-food markets spread around the Bay Area, Off the Grid has made four prior forays into the East Bay: Aside from the now-shuttered Gourmet Ghetto market, there’s still a market in Hayward on Monday nights, one in South Berkeley on Tuesday nights, and another in Alameda on Saturdays. But Oakland, with its burgeoning foodie culture, is in many ways the most plum location of all for a large-scale food truck gathering — one need look no further than the size of the crowds at Eat Real Fest for proof. Matt Cohen, proprietor of Off the Grid, said he and his staff have spent the last year and a half looking for the perfect spot to launch Off the Grid’s first Oakland market. “We wanted a great space that people are going to want to come to regionally — something that was going to be more than our typical locations that we might do elsewhere,” Cohen said. Off the Grid had worked with Oakland Museum for a series special events this past summer, and Cohen said he fell in love with the space, which reopened in 2010 after an extensive renovation. Out with Off the Grid North Berkeley; in with Off the Grid at the Oakland Museum (via Facebook). After Off the Grid’s recent (and rather sudden) departure from North Berkeley, there was some talk about how a portion of that neighborhood’s brick-and-mortar businesses couldn’t wait to get rid of the weekly event. But if ever there was a mutually beneficial arrangement (a case of you-scratch-my-back, I’ll-scratch-yours), this latest Off the Grid offshoot seems to be that. It helps that the two- or three- block radius surrounding the museum has few brick-and-mortar dining establishments that are open at night, so — while time will tell — it appears that there’s less potential for conflict. More exciting, though, is the fact that, in order to accommodate the weekly food truck event, the Oakland Museum will stay open late (through 9 p.m.) on Friday evenings, offering half-price admission to its galleries and a variety of free programming designed to complement the food truck gathering: film screenings, live music and dancing under the stars, and a beer and wine garden set up around the koi pond in the sprawling atrium area near the museum entrance. The hope, of course, is to take advantage of huge surge in potential customers that Off the Grid will attract: burrito enthusiasts or cupcake connoisseurs who might not otherwise have thought to visit the museum — certainly not on a Friday night. Still, in some ways the decision to launch an Off the Grid market in Oakland now is a bit of a gamble. The recently extended interim food truck policy is set to expire on July 1. If city officials aren’t able to come up with a permanent policy before then — or if the one they come up with isn’t agreeable — Cohen will only have had about five months to recoup his initial investment (on permitting fees and so forth). He added that the good thing about launching the market now is that, because the Fort Mason Off the Grid is closed for the winter, he and his staff will have two months to really concentrate on getting the Oakland market off to a good start. The lineup of trucks for the opening event on January 25 hasn’t been finalized, but Cohen said the roster will likely draw from popular (and East Bay-based) standbys such as LIBA Falafel, Go Streatery, FiveTenBurger, Koja Kitchen, and Arki Truck. As with most of the other Off the Grid markets, the new Oakland Museum offshoot will provide amenities like seating, canopies (in case of rain), lighting, and additional live music outdoors. 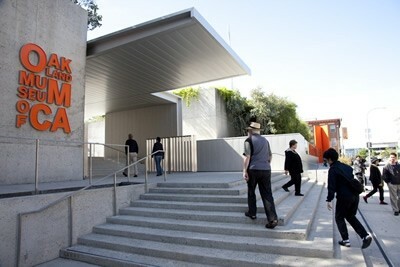 Paid parking will be available in the Oakland Museum parking garage, and Cohen said there should be plenty of street parking on both Oak and 10th streets as well.